A fire chief who is taking on one of the top jobs in the country describes himself as “an accidental firefighter”. 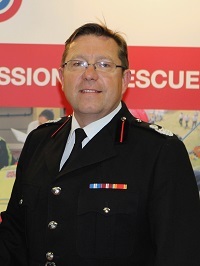 Hampshire Fire and Rescue Service’s Assistant Chief Officer Steve Apter has been handpicked to be London Fire Brigade’s Interim Deputy Commissioner. As Director of Safety and Assurance the 50-year-old dad of three is taking on responsibilities for the capital, such as special operations, resilience and organisational development. Yet the Isle of Wight resident said he never imagined himself becoming a firefighter and spent his early years picking up valuable experience in the world of commerce. After completing a business degree at Bournemouth University, he became a specialist in business start-ups in the Midlands and imagined a future in industry. However, this was all to change when he picked up his first hose as a retained firefighter for the Isle of Wight Fire and Rescue Service 26 years ago. It was here he added to his academic profile achieving the Executive Leadership Programme qualification at Warwick Business School and a masters degree in strategic leadership at the University of Portsmouth. ACO Apter, whose brother John is Hampshire Police Federation chairman, said: “I remember as kids John would dress up as a police officer but I had never considered the fire service. After a year the Liverpool-born firefighter went full time, eventually leaving as a seasoned Chief Fire Officer to take on the position of ACO at the larger HFRS after helping to establish a working partnership between the two services. ACO Apter, who lives in Binstead, was also recently seconded to support the senior management team in East Sussex Fire Service as their Deputy Chief Fire Officer for seven months. As well as experience of being Head of Fire and Rescue, Road Safety and Emergency Management for the IOW council, he was also the Community Safety Partnership chairman on the island. One of his most recent achievements was earlier this year when, as chairman of the UK Rescue Organisation (UKRO), he hosted the annual rescue challenge, which saw elite firefighters come to HFRS’ Eastleigh HQ to showcase their skills and compete across a variety of disciplines. He has also been involved in travelling to developing countries to help train and raise the standards of their firefighters. He will take up his new post on Thursday (December 1) and will be working under Interim Commissioner Dany Cotton, London Fire Brigade’s first female chief. He said of the job: “I am extremely proud and excited to take on this role, and looking forward to working with Dany. “It seems a poignant moment to start this new adventure as the Brigade has just appointed its new commissioner and other changes are taking place in the service. It is also the year that marks 150 years of the LFB. “London is a brigade like no other with the range of challenges and issues firefighters have to be prepared for.